Have you ever been to Abbot Kinney in Venice? Well, I went for the first time while I was in LA over the weekend, and WOW. What an amazing collection of stores! At the top of my list was, of course, Alexis Bittar -- and, true to form, I simply had to make a purchase. 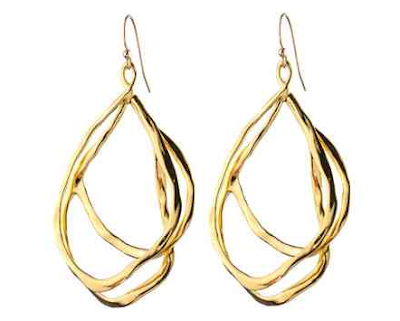 After combing through each and every case three times and picking out a bunch of possible pieces, I settled on the Gold Large Interlaced Earrings. Now, these earrings are not for the faint of heart. They're unbelievably large -- they hang down to my neck! But, with that being said, they're actually extremely lightweight -- I don't even feel them hanging from my ears. I love the intricate interlocking liquid links that form an almost cage-like design. These earrings are so different from everything else in my collection -- I've already worn them three times, and I've only owned them since Saturday! My jewelry collection is most definitely unbelievably better now that these earrings are a part of it.